I try to avoid junk food most of the time, though I have a couple of guilty pleasures. This is the perfect cure for the Christmas party season and will fix many a hangover. This is inspired by a recipe that first appeared in the Guardian's student cookbook, and on one particularly hangover-addled morning the boy and I decided it was the only thing that could possibly fix us. I think this well and truly eclipses the McDonalds version. The only concession to the original is processed cheese slices, which I rather like. However, if you want to be a good food purist about it, I suppose a nice mature cheddar will work just as well. I like mine with peri peri sauce, though if you want a gentler version, use ketchup instead. As this is basically an assembly job, I suggest turning the oven on to about 100°C to keep things warm as you go. Begin by grilling the sausages - they will need 15-20 mins to cook through. While the sausages are grilling, fry the bacon until lightly browned but not quite crisp, then put in the oven. Next, slice the muffins in half and toast them. Again, put these in the oven to keep warm. Put a pan on filled with about 4cm water, add a lidful of white wine vinegar to the mix and bring to the boil. Once boiling, turn down the heat so it reaches a gentle simmer. At this point, put the sausages in the oven. Making poached eggs without a mould isn't hard at all. The most important thing, which I cannot stress enough, is making sure that the eggs are really fresh as it is this moreso than any swirling of water or other bits of trickery that will make the eggs keep their shape. I swirl the water a little, then add the eggs one after the other and simmer for 2-3 minutes. While the eggs are simmering, put the muffins on plates. Spread a little mustard on the inside top of each one, then slice the sausages into thirds lengthways and place on the bottom muffin slice. 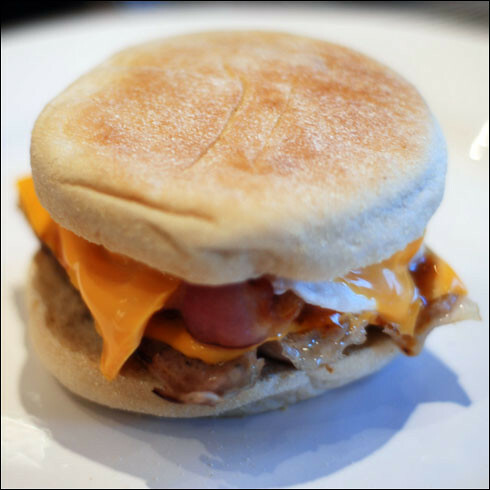 Put a slice of cheese on top, then add the bacon and some ketchup or peri peri sauce. Next, using a slotted spoon, remove the eggs from the water one by one and place on top of the bacon. Add the second slice of cheese and then place the muffin lid on top. Voila! Tasty, hangover-fixing junk food. And with a delicious runny yolk to boot. I want this in my belly right. now.